The realisation that, once you’ve reached the top there’s nowhere to go except down, is inescapable. The goal that you set yourself – that motivated you – has been attained. So now what? 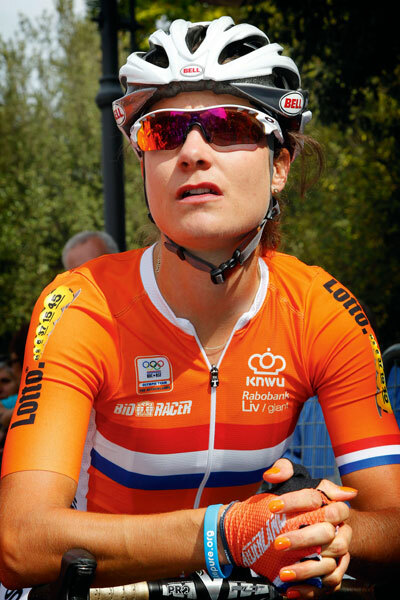 It’s a state of affairs that very few cyclists are ever confronted with, but it’s something that 2013 world road race champion Marianne Vos has dealt with several times. “Yes, it’s true, after you win, it’s hard to find the motivation again. When you’re still trying and on the way to achieving something, it’s easy to be motivated. “When you cross the line to win, in that instant, it’s a fantastic feeling but the next day? Well, it’s just the next day and you’ve reached your goal, you have the medal or the jersey, but what does it bring you? What have you got? For sure, the moment of success is great, you have your medal, but three weeks after, the world hasn’t changed,” Vos says, in the midst of autograph signing at the end-of-season Braveheart Fund dinner. “Recently I’ve started to think that, for me, it’s not about getting that medal or whatever, it’s more about me trying to improve myself as a rider. I like the feeling of the win, but you have to have fun along the way, because it’s not only the win that you go for. Even a cursory perusal of her palmarès will reveal that Vos has been winning big for over a decade and, as with any ‘normal’ human being, you’d have expected her internal drive to push herself to have been exhausted. Far from it, Vos keeps on finding new goals and setting herself new challenges. “I enjoy being an athlete, I enjoy trying to get the best out of myself every year,” explains Vos, who doesn’t appear interested in simply winning ‘more’. “I like the game in racing, it’s not about the margin of the win or the number of wins, I like winning by one millimetre, it’s about the feeling of the win and, actually, this year’s World Championship gave me more satisfaction than last year in the Netherlands. But, of course, the more Vos wins, the harder it is to win. There’s barely a race she enters without the rest of the women’s peloton looking towards her to decide the shape and outcome of the race. Can you imagine what it felt like as a Dutch woman, fresh from winning the Olympic road race gold in 2012, in the run-up to the road World Championships in Valkenburg? 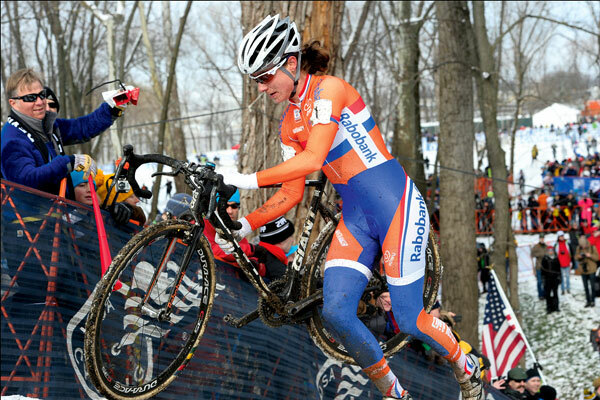 “Yes, the pressure was high,” recalls Vos. “After the Olympics everybody expected me to win, but, for me, it wasn’t so bad because after I won in London, the pressure was off. The thing is that you only have a chance to win an Olympic gold once in four years and it might turn out be your only chance. After the Beijing Olympics, it was my biggest goal to get gold in London, which I did. Which is exactly what Vos came away from Valkenburg with, to put beside the one she had already claimed on the rain-drenched Mall. So, does Vos have a special routine or strategy in place for coping with the pressures that come with being a well-marked rider and dealing with the stress generated by an eager public, media and sponsors too? “Well, what I try to do is concentrate on all the things that I’ve done, that I’ve done everything I could and it’s gone well, so I’m well-prepared, I’m well-trained and everything that I can do, everything I can control, I’ve done it. I try to make sure that the team is well-prepared and that we have a good atmosphere and that we’re all focused. We know our tactics, our bikes and materials are good and then …you just have to go and race and see what happens. Vos is clearly a thinker – it’s hard to imagine getting as far as she has without a deal of reflection – though she has never worked with a sports psychologist. “I like to talk and listen a lot to other riders and earlier on, with the national coach Johan Lammerts (ex-Panasonic pro and Greg LeMond’s right hand man at Z) and my Rabobank team coach at the time Jeroen Blijlevens (ex-TVM sprinter) they were really good to talk with about tactics, not to talk about my feelings or something, but to talk to about racing. While Vos’s numerous winning performances have some comparing her to Eddy Merckx, Vos herself isn’t even close to accepting that sort of label, no matter that, in terms of her all-round ability (whisper it), she’s probably the best rider of any gender we’ve ever seen. Isn’t it just a matter of her rocking up to the start line, checking her tyre pressures and riding off to win? “Ha! I know some people talk about me just turning up and thinking I must enter a race with the feeling I’m going to win, well… never! Vos has had plenty of time to think about motivation in her career and has had to reinvent herself or at least find new challenges to stimulate her. There aren’t many riders who have won world and Olympic titles on road, track and cyclo-cross. And, if we include her national cross-country mountain bike titles, then her range of skills quite simply elevates her to another level. “For me it’s something new, a new challenge. It was nice because I talked about marginal gains and how I’ve reached the point where I can’t make big steps on the road, but there were big gains in the beginning when I started riding and racing cross-country mountain bikes. It was fantastic! It’s never happened to me in other disciplines, but I trained on a mountain bike for a week and I was miles better, technically more than physically, and that was fantastic!” explains Vos with an enthusiasm that’s probably bad news for the mountain biking regulars. The idea of a renewed Vos throwing herself into a new challenge – where she failed so infrequently in the past – is more worrying because she appears to be relishing the challenge. “It felt like a good step for me. And fun, too. At that point, I wanted to try it to see how far I could get. I did some races because I liked racing, as well as the competition, but also I wanted to compare myself to see where I was in relation to the others. I wasn’t too bad, but I know that there’s still a long, long, long way to go. For some riders, the switch from mountain bike to road racing happens at the expense of the former. And it generally goes from lower profile, lower-earning potential mountain biking to road. For Vos that would be far too simple. Instead, she’s thinking about tackling both events in Rio. Is that really possible? Seriously? Surprisingly, Vos reckons that both the training and the race timetable in Rio would make it possible for her to go for both. “Yes, mountain biking and road are possible to do together, but it’s difficult. I have to work so much on the technical side. Physically, it’s not so bad. I’ve experience of combining cyclo-cross and road; it’s sort similar, but not exactly the same. From Netherlands junior mountain bike cross-country champion in 2002 to Olympic cross-country champion in 2016, via world titles and Olympic titles on road, cyclo-cross and track would be a tall order for anyone, a sort of mission impossible for run-of-the-mill riders. But it’s clear from her career and outlook that Vos is no ordinary talent. Check the betting odds on her winning mountain biking Rio gold. It might be a shock, but it wouldn’t be a surprise. With her status as the world’s best, Vos is finding that she is the ‘go-to’ rider in the women’s peloton when it comes to opinions and quotes on women’s racing, doping, prize money and safety. 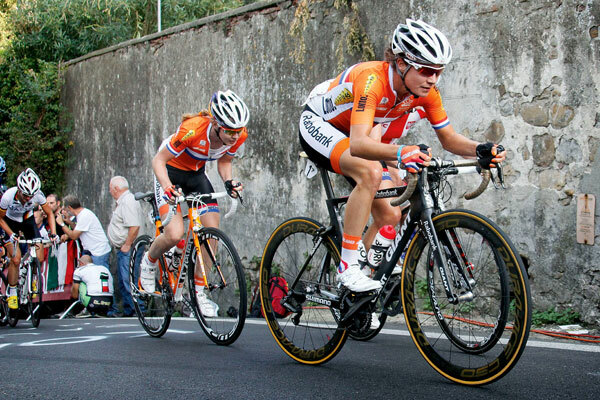 At the women’s Giro della Toscana in 2012, the race security left a lot to be desired. In as much as there was oncoming traffic on some stages and, when riders were dropped from the main bunch and out of the following cars, they were on their own, in the traffic. “Security was a big issue and it wasn’t really just at that one stage, it was the same earlier in the race and we had a moment where we said: ‘OK that’s enough’. We had to do something because it wasn’t right. Some Italian riders came to me to ask what we should do. I don’t really like the public protest, but what else can we do? The race organisers’ argument was: ‘Well, nothing has happened yet, so we should carry on.’ No! Nothing has happened yet! But should we carry on till someone is killed or injured? !” Vos, leading the race and set to win, pulled out, along with the rest of the peloton. It’s the sort of unofficial responsibility that comes with Vos’s status and, in addition, she is on the UCI ethics commission, though she’s not entirely comfortable with her role. “I can only say my opinion about that sort of stuff. You don’t feel like a figurehead of the sport. That’s the reason I’m in the UCI ethics commission – to do something with that position. I’m able to talk and they will listen to me. I try to not only tell them my position but also to speak for the peloton. “Sometimes, you know, I don’t know the answers either. What can we do with women’s cycling to get it to grow? I don’t know – but I’m trying (laughs). I have no big idea, there’s no Eureka moment, it won’t happen in a year, but it’s growing and I’m happy with where we are now. “Compared to even when I started, the teams are far more professional. The salaries aren’t there yet compared to where we want them to be, but it’s growing. But if we want more money then we have to be worth it and at this moment we’re in a position that with the level of media attention we get, we aren’t really in a position where the sponsors are willing to pay much more. But if you look at it the other way around, how do we get more media interest? Well, we have to be more professional and that takes more money, so it’s like a chicken and egg situation – where do we start? I’ve been in discussions with the UCI and I don’t know, but maybe we should force some things and others will develop. “Or maybe we should let it grow naturally and hope that there are changes? I still don’t know,” confesses Vos, candidly.